Elisabeth Carey Miller was born in Spokane, Washington, although she spent most of her life in the Seattle area where she attended the University of Washington. A world renowned horticulturist, she was a member of over 25 horticultural organizations, received numerous national and international awards, and was regarded as one of the finest plantswomen of the world. Her own garden contains some 4,000 species, many of which are unique in the western hemisphere. 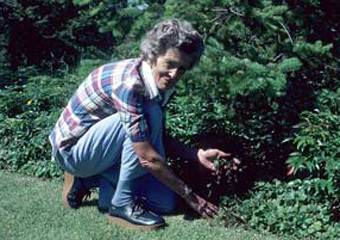 Mrs. Miller was not only known for her gardening skills, but also for her community involvement, having served as a driving force for the creation of the Center for Urban Horticulture and the Elisabeth C. Miller Library at the University of Washington Botanical Gardens as well as the Seattle Chinese Garden. The Elisabeth C. Miller Library represents one of the best horticultural book collections available to the gardening public. She was a founder of the Northwest Horticultural Society and an active member of the Garden Club of America and served on numerous boards and as a facilitator of several civic projects. She was well respected for her generous contributions of time and financial support to public horticulture and the community at large. Her legacy continues not only through the Miller Garden but also through the Pendleton and Elisabeth Carey Miller Charitable Foundation. Learn more about organizations and projects supported by Mrs. Miller.